Fly fishing for northern pike is exhilarating! Massive flies and massive fish. Northern pike flies are huge, some as large as 12 inches (30 cm). Large flies are necessary because northern pike can eat other fish up to half their length so to attract northern pike, a fly has to at least give the impression of being a worthy size to eat. Northern pike are well know reputation for savagery and that has given them the nickname “fresh water wolves”. Even a relatively small northern pike, around 20 – 24 inches, is quite a fight on a fly rod, and when you hook into large northern pike in the 30- or 40-inch range it is “battle royale”. Our 18-foot cedar wood boats are fantastic for fly fishing. Very stable with an extra wide mid seat bench allowing for a wide and very comfortable raised stance. The classic beauty of our cedar wood fishing boats also adds to the ambiance of your fly fishing experience. Techniques for northern pike fly fishing depend on how northern pike are feeding. Spring northern pike are feeding heavily and will take smaller 6-inch streamers. Try various retrieval depths, strip speeds and actions until something works. Try casting your fly, let it sink for a few seconds then retrieve the line in short, snappy 4-inch strips every second or two. Lively up and down action seems to work well in spring. Brass or other dumbbell eyes add action to large pike streamers. 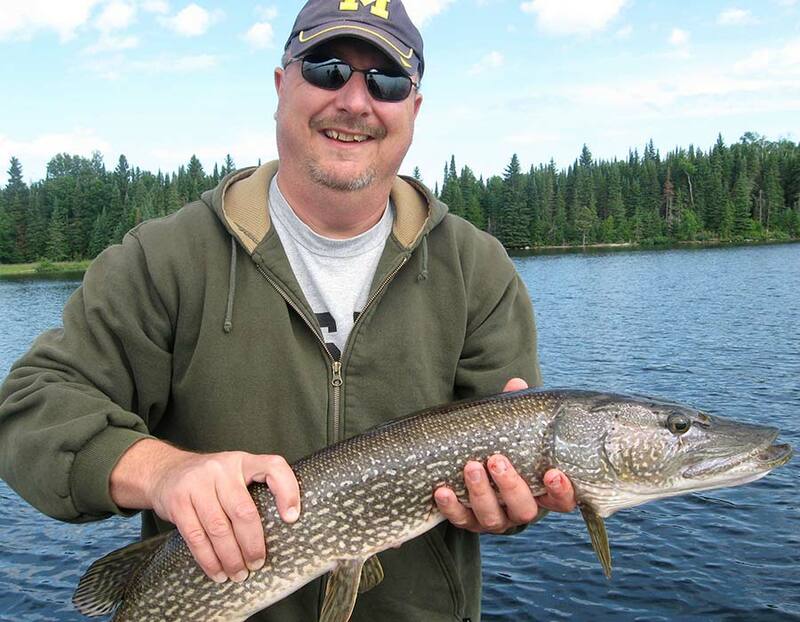 Northern pike in summer tend to be a bit lazier and pick on larger food, larger fish, ducklings, small animals. Surface or floating flies can be a lot of fun in summer. As we get into late summer, northern pike hunt a little deeper but still prefer larger prey, so extremely large streamers that you can present 6 – 10 feet down seem to work better and sometimes slower, steadier retrieves. Northern pike do not seem to be significantly particular about flies matching bait colors closely and some of the best northern pike flies are very brightly coloured. Remember, northern pike are killers first, eaters second. Eyes on flies seem to be very effective for northern pike.